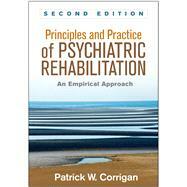 by Corrigan, Patrick W.; Mueser, Kim T.
The authoritative text on psychiatric rehabilitation, this book covers everything from conceptual and empirical foundations to exemplary program models. Students and practitioners gain the knowledge needed to help adults with psychiatric disabilities move forward in their recovery process and build personally satisfying lives. The book presents tools and strategies for assessing personal needs and strengths, integrating medical and psychosocial interventions, and implementing supportive services in such areas as housing, employment, education, substance abuse, and physical health. Numerous case examples illustrate both the real-world challenges of serious mental illness and the difference that effective interventions can make. *Incorporates the latest concepts and evidence-based interventions. *Streamlined chapter organization: more concise, yet still comprehensive. *Heightened focus on empowerment, self-determination, and wellness promotion. *New or expanded discussions of the "housing-first" model, harm reduction, peer services and support, and the Affordable Care Act. Patrick W. Corrigan, PsyD, is Distinguished Professor of Psychology at the Illinois Institute of Technology. Previously, he was Professor of Psychiatry and Director of the Center for Psychiatric Rehabilitation at the University of Chicago. His research examines psychiatric disability and the impact of stigma on recovery and rehabilitation. Currently, he is principal investigator of the National Consortium for Stigma and Empowerment, a collaboration of investigators and advocates from more than a dozen institutions. Dr. Corrigan has published more than 300 peer-reviewed articles and 15 books. He is editor emeritus of the American Journal of Psychiatric Rehabilitation and editor of Stigma and Health, a new journal published by the American Psychological Association. 1. Who Are People with Psychiatric Disabilities? 3. What Is Psychiatric Rehabilitation?